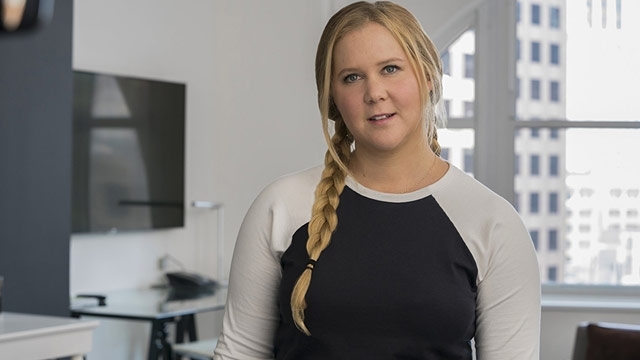 It takes a lot of courage to do what Amy Schumer does in I Feel Pretty. The stand-up comic bares her body to play Renee Barrett, the average woman. She works at Lily LeClair, an upscale cosmetics company trying to break into the mass market with a line of products targeted at bargain hunters. Surrounded by thin fashion models all day, she’s plenty insecure and can’t stand the sight of her own body in the mirror. While that may be relatable to a lot of people, the premise is inexplicable. During a fitness class, Renee bangs her head and goes unconscious. When she wakes up, she has lost her insecurity and finds enormous, outsized confidence in its place. This new attitude prompts her to ditch her existing, higher-paying job in the cramped Chinatown office and chase her dream of working at the company’s fancy Fifth Avenue headquarters in trend-setting Manhattan. Along the way, she meets Ethan (Rory Scovel) at her dry cleaner, and we get to see her forge a cheeky romance as she climbs the corporate ladder. Schumer sells both the romance and the comedy well. She overdoes the arrogance for comedic effect at the right times, and when she tones it down she also shows that self-confidence and a good sense of humor can be rather winsome. Emanating confidence with every jaunty step she takes down the streets of trendy Manhattan, her portrayal of a sprightly attractive woman is believable and inspirational. Scovel balances Schumer’s boldness with just the right amount of softness. The movie serves up plenty of hilarious moments that’ll get laughter rolling through an audience. Still, a lot of the movie is spent belaboring the not-so-clever humor when it could’ve left well enough alone. The issue is made worse by a meandering plot that lacks momentum. As funny as the movie is, and as charismatic as Schumer can get, there are a lot of set-pieces that feel like they were thought up of on a whim and finagled into the script. It was as if co-writer/co-director pair Abby Kohn and Marc Silverstein decided to indulge their desire to give Schumer as much screen time as possible. It also doesn’t help that a few of the gags are reused. Although the movie’s messages of self-acceptance, inclusion, and the rejection of glamor magazine-beauty are admirable and important, it doesn’t do much to add to the conversation aside from merely pointing out issues that have been in the public consciousness for a while now. It’s neither clever nor especially incisive, which is why it’s a tough to overlook the movie’s flaws.